17.05.18 09:42 Transfer Sent Payment: 60.00 USD to account U15117436 from U1294xxx. Batch: 214975293. Memo: Shopping Cart Payment. 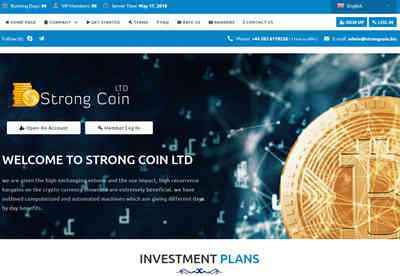 Deposit to strongcoin.biz User allhyips. 17.05.18 11:10 Receive Received Payment 1.00 USD from account U15117436 to account U1338028. Batch: 214982242. Memo: API Payment. Withdraw to hyiphotlister from strongcoin.biz. Memo : API Payment. Withdraw to hyipivn from strongcoin.biz. 17.05.18 12:17 Receive Received Payment 1.00 USD from account U15117436 to account U2392379. Batch: 14990883. Memo: API Payment. Withdraw to skyhyip from strongcoin.biz. $1.00 has been successfully sent to your PerfectMoney account U2793764. The amount of 0.2 USD has been deposited to your account. Accounts: U15117436->U1557892. Memo: API Payment. Withdraw to paymentstat from strongcoin.biz.. Date: 19:09 18.05.18. Batch: 215120415. 18.05.18 19:09;Account;Receive;Received Payment 0.3 USD from account U15117436 to account U1294000. Batch: 215120417. Memo: API Payment. Withdraw to allhyips from strongcoin.biz. 20.05.18 06:13;Account;Receive;Received Payment 0.3 USD from account U15117436 to account U1294000. Batch: 215232260. Memo: API Payment. Withdraw to allhyips from strongcoin.biz.